Pet food companies have always been eager to get into bed with breeders – after all, we are (rightly or wrongly) considered ‘experts’ on what to feed our own breeds, and our puppy buyers open up an entire new market to the pet food manufacturer that they would otherwise have to compete for. Major manufacturers offer dog breeders a raft of things to encourage their business – frequent buyer points, bulk discounts, team jackets and sometimes even dog show sponsorship. I have to wonder, however, at any pet food manufacturer that seems to be going out of their way to court the USDA/Puppy mill auction selling breeders – who else are you courting when you host seminars on ‘breeding better bulldogs’ right on the auction site itself? SPECIAL NOTICE: We will be hosting a Bulldog educational seminar on Friday night at 6:00 pm after the sale. The topic is “How to be a successful Bulldog Kennel.” The subjects are, implanting, cesarean sections, progesterone testing, how to use a Draminski ovulation detector, what to look for & look out for in English & French Bulldogs. The guest speaker in Dr. Samuel L. Harkey D.V.M. of All About Pets Veterinary Clinic..
Seminar & Meal sponsored by Pro Pac Dog Food Co. “Dinner is Free” R.S.V.P. Wow, they’re even throwing in dinner. That’s pretty generous of Pro Pac, isn’t it? Now, maybe I’m missing something. Maybe Pro Pac is proud to be the official dog food of puppy mill auctions (that would make a nice ad campaign, wouldn’t it?). I can’t help but suspect that they didn’t want their new ‘premium, holistic’ food, Earthborn, to be known as the food that sponsors puppy mill seminars. Again, maybe I’m wrong. I guess the best thing to do would be to write to Pro Pac and ask them if they can explain it all a bit better. I did already, but so far no response. A Maryland woman didn’t hesitate to jump into a basement well when her four month old French Bulldog puppy fell in. The rescuer needed rescuing on Wednesday when a Chesapeake City-area woman found herself stuck inside a basement well that she climbed into to save her puppy. The woman and the puppy were rescued in about 10 minutes. She had cuts and bruises, but was taken to nearby Union Hospital in Elkton, Md., for a checkup. The puppy was not injured. 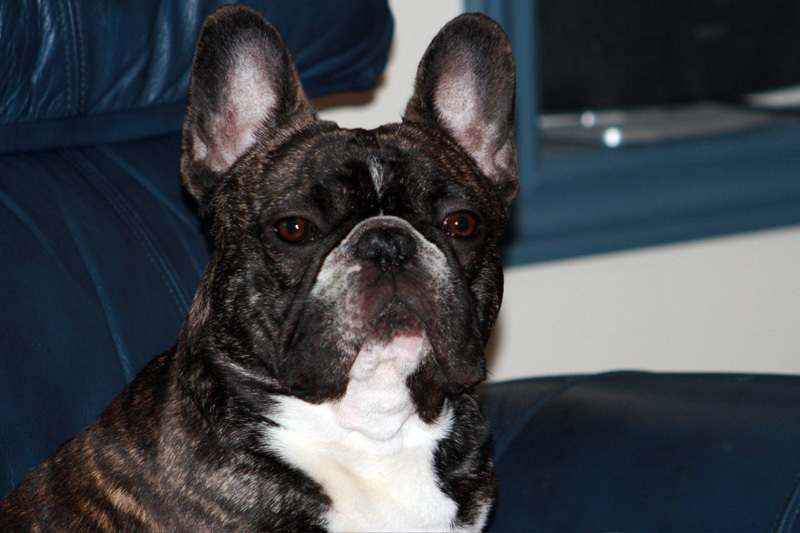 Common knowledge says that ALL French Bulldogs drop dead of something or other by the age of five. Those that don’t are relegated to a life of riding around in mobility scooters or needing ramps to get up and down off of curbs. Someone forgot to tell that to Gunny – Bullmarket Spirit Shogun Dragon – who, at age eleven and change, is still competing in and winning agility trials with his owner Andrea Morden Moore.